A mother has called for more help for parents of children removed from schools, saying she was left "bewildered" when her son was excluded. Liz's son was out of school for six months and later diagnosed with attention deficit hyperactivity disorder (ADHD). The most recent figures for 2016-17 show a 51% rise in pupils permanently excluded from schools in Wales. A teacher's leader said numbers were low and decisions were taken seriously. 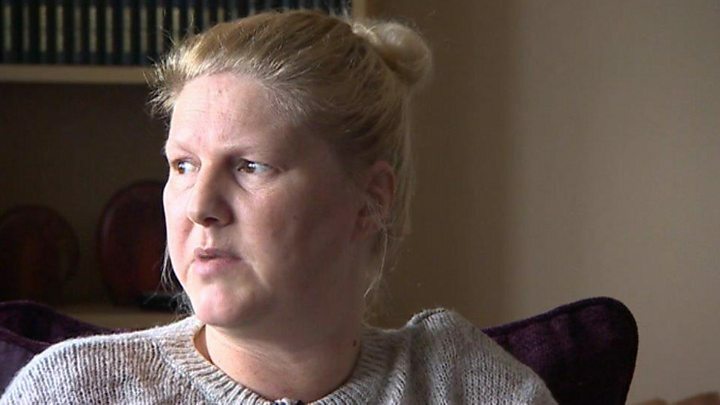 Liz, who lives in Bridgend county, said problems began when her son started secondary school at a time when his father had moved out of the area and his grandfather had died. Liz picks up the story. "When he started secondary school he wasn't settling, he found it overwhelming I think. Then he had his appendix out, he was quite poorly and when he went back, he'd fallen so far behind, that's when his behaviour really deteriorated. Reality Check: Why are 1,000 children being expelled? What is it like to be excluded from school? "It started off fairly small things - disturbing the class, making funny noises. Then it got to the point he was getting up in class, wandering around, distracting the other children which then went on to leaving the classroom, running around the school, no respect for the teachers. "For him, he saw school as a big game. I was constantly angry with him, getting calls at work to collect him from school - it was on a daily basis. I just wanted him to stop, I put punishments in place and tried grounding him, but it was a constant battle. It was horrific. "The school weren't helpful in any way. The exclusion started, maybe one day or two days a week. "In between he was playing truant. When he was there he was causing absolute chaos. I believed he needed counselling - that never happened, they [the school] said they tried it with a teacher. "The first day of his second year, he went to school. I had a call to say he'd really gone on a 'jolly', teachers were looking for him and he was going to be permanently excluded. I was so upset. He came in the house and went upstairs. His head was bowed and he said: "Mum, I don't understand why I do the things I do,". And I cuddled him. There was nothing else to do but hold him. Another local school was full - so what happened next? "A social worker got involved and managed to help get him into another school [10 miles away]. That school really tried with him - it was hands on from the minute he got there and that was the first time then words about his diagnosis [ADHD] were used. But he couldn't cope with mainstream school - me and the head of year made the decision to remove him because it was hurting him. He'd made so many improvements but it was hurting him. "He was feeling low. I remember him saying "what's going to happen to me mum?" It broke my heart and I said: "You're going to be fine." "He did worry. This wasn't a child who didn't want to do anything with school. "He's now at a different school - for children like him, children with other conditions and disabilities." From an initial two hours a day he is now back at school full time. "From that day to this, what a change in the boy - the school are marvellous with him. He still has his off days but he's come on so much." Far fewer pupils are permanently excluded than in the middle of the 2000s. Guidance was issued by the Welsh Government in 2012, setting out how exclusions should be used and to do so permanently should be only a "final step" in the disciplinary process. But both the numbers - and rate - of permanent school exclusions have jumped in the last year. Some pupils - like Liz's son - are excluded for persistent behaviour issues. But violence or supplying drugs are two reasons why a pupil might be permanently excluded for a first or one-off offence. Dr April May Kitchener runs Siarad Da, which works with some children who have been excluded and their families. She said that there are big differences in the way schools approach exclusions, with some offering more pastoral support than others. "We are seeing children with challenging behaviour because of learning difficulties experiencing greater levels of exclusion but we are also seeing lower levels of tolerance for these children as well particularly in a school which is pushing very hard to show how well it's doing academically," she said. Tim Pratt, director of the Association of School and College Leaders Cymru, said: "The rate of exclusions has increased at a time of intense funding pressure on schools in Wales. "This makes it more difficult to provide the early intervention which prevents behavioural issues from escalating to the point of exclusion, and this is therefore likely to result in an increase in the number of exclusions." Knife crime: Are school exclusions to blame? Why has Scotland's exclusion rate dropped? He added: "Even so, the rate of exclusions, and particularly permanent exclusions, remains low, reflecting the fact that these decisions are taken extremely seriously and only after a great deal of thought and consideration." Mr Pratt said it was sometimes necessary to permanently exclude in the best interests of other pupils, while excluded pupils could also benefit from a fresh start elsewhere. Liz said looking back, the experience was "bewildering" and "a hard two years" for her son. "There was no help in place - he was off school for six months and I still had to work, a lot of times that boy was on his own, he was down, he was very unhappy. She said she "doesn't understand the logic behind it - your child is really naughty we're going to move him on, it'll be someone else's problem. How does that ever help the child?" A Bridgend council spokesman said supporting the best possible outcomes for children was a priority. "A clear and agreed process is followed when permanent exclusions are issued by schools," he said. "They are always a last resort, and exclusions had steadily decreased in recent years." Is there a link between Scotland's exclusion rates and knife crime?